UMBC believes that entrepreneurship is the ability of an individual to identify a goal, provide the leadership and mobilize the assets necessary to reach that goal. As such, individuals taking the risk to push the envelope in science and technology, break ground in the creative arts or craft new solutions to society’s problems are all entrepreneurs. 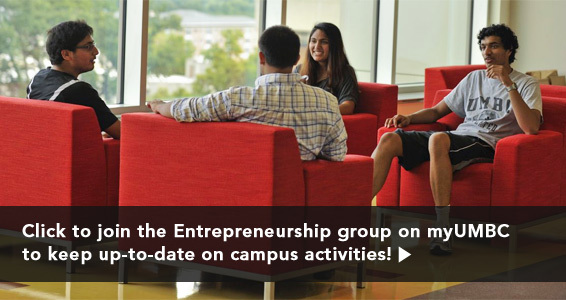 At UMBC, we believe in entrepreneurship. It is our mission to infuse the university with the thinking and attitude, activities and ideas that will inspire entrepreneurial accomplishment in all its forms. Whether students are interested in exploring entrepreneurship as a career choice or intend to follow a more traditional path, the Alex. Brown Center for Entrepreneurship has the resources on hand to help them on their way. From assistance in writing business plans and networking with experts, to credit and non-credit courses, and speaker series featuring regional business stars, the Center provides the guidance and connections to real-life experience necessary to make an informed decision. Through the Center, students can gain targeted expertise through internships, test their skills through competitions, accelerate a business concept through the Idea Lab, attend courses and lectures tailored to spark their entrepreneurial spirit,and obtain assistance and mentoring from Entrepreneurs-in-Residence and a wide variety of entrepreneurs and business leaders.